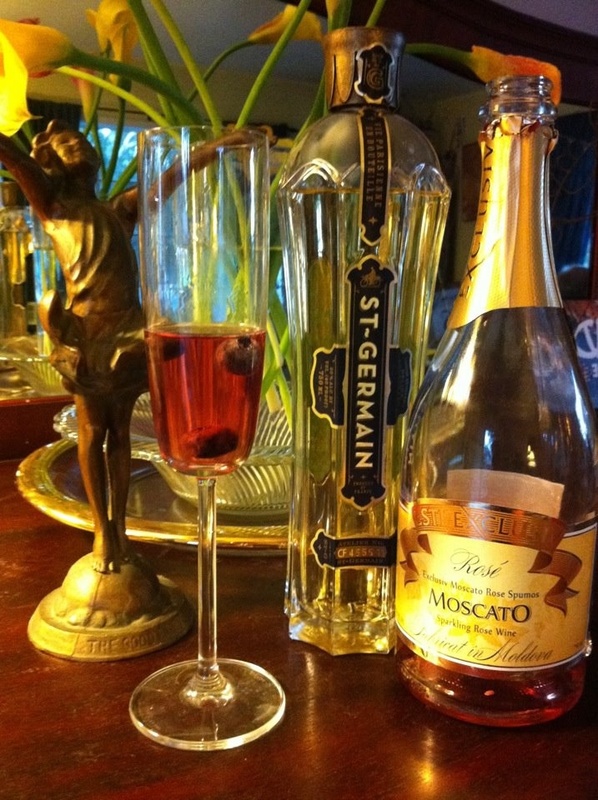 Kick off your Father’s Day or Summer Celebrations with the PERFECT cocktail: Exclusiv Moscato Sparkling Rose with St Germain Liquer “La Rosette”! The Sparkling Rose by itself is wonderfully lively, refreshing, and it dances on your tongue. Invite all your friends over for brunch or take it to a summer outdoor picnic concert; it will go with cheese blintzes with fresh fruit or jam or with grilled fruit and smoked trout salad. Bacchus Schmaccus thinks he’d like it with lox and bagels while Ima Zinner wants this wine with waffles and blueberries. Rose Moscato wine is cultivated from the Muscat grape, the only grape to produce wine with the same sweet aroma as the grape itself. The Muscat grape gives Rose Moscato wine a sweet and rich aroma of dried fruits, raisins and oranges. We all agree this is a great inexpensive sparkler for Father’s Day brunch. You might think it’s too cotton candy strawberry soda sweet but it’s got a beautiful watermelon color; your mother-in-law who goes for white zin would love it. We got some almond and lots of fresh fruit. While we all thought it was a fine fun sparkler for under $10, WE ABSOLUTELY LOVED the Exclusiv Moscato Rose with a dash or two of St Germain Liqueur. I mean, we went crazy for this combination of rose sparkler and French elderflower magic! So pretty and so tasty. It’s still sweet but with a complex flavor; the St Germain certainly adds to the pleasure of drinking the sparkling wine turning it into nectar. This combo reminds us of jasmine and honeysuckle wafting through your window after a warm spring day. 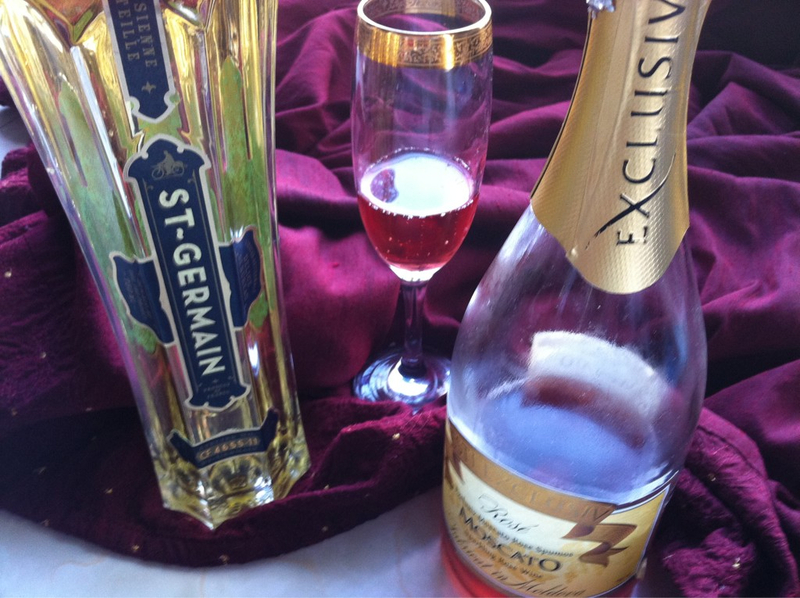 The St Germain adds so much to the pleasure of drinking this sparkling wine. For even more pizzazz, we added fresh blueberries! Method: Pour ingredients into a chilled fluted glass and stir lightly. Float half a strawberry as a garnish. Drink a toast to the elegance of simplicity and the divinity of les fraises fraîches. Variation: Experiment with other garnishes. A lemon twist, or raspberries perhaps. Just don’t tell the strawberries – you know how jealous they can get. Go for blueberries! They’re in season!